Many expectant mothers have questions about expressing breast milk. One commonly asked question is whether they should purchase a breast pump during pregnancy. The answer isn’t a straight ‘yes’ or ‘no’. After the birth, if baby and mother can be together for all feeds, and if the baby breastfeeds well, the truth is there’s really no need to express at all. However, there are times when a mother might need to express in order to provide breastmilk for her baby – for example, if her baby is born prematurely or has a cleft palate. There are other situations, too, where a mother is returning to work and wants to express to maintain her supply and provide her baby with breastmilk when she’s away. So, if a mother expresses her breast milk, what pump is best for her to choose? The decision largely depends on individual circumstances. You can read more in Belly Belly’s article Choosing A Breast Pump – 4 Things You Need To Know. One factor to consider before purchasing a pump is how well it removes milk. Recently, manufacturers of a new kind of breast pump called Anabella claim their pump can remove close to 100% of a mother’s milk. But is this true? Can a breast pump remove almost all the available milk from a mother’s breast? Can A Breast Pump Remove Almost 100% Of Milk From A Breast? There is no breast pump like a baby. A mother’s body is designed to respond to her baby, not to a machine. A baby who breastfeeds well will always be able to remove milk better than any breast pump can. Unfortunately, the manufacturer of this new breast pump doesn’t provide any research to back up the claim the pump can remove close to 100% of the milk from a mother’s breast. On the other hand, there is evidence to show babies remove between 63% and 72% of the available milk during a breastfeed. If babies are only able to remove almost 75% of available milk, then what does this say about the manufacturer’s claim? Furthermore, the same research suggests breasts don’t need to be drained completely at every breastfeed in order to maintain adequate milk supply. So, although removing milk well and often is important, removing 100% of breast milk isn’t really necessary.. It can take quite a bit of practice to express breast milk effectively. A mother’s let-down reflex needs to be conditioned to respond to a breast pump. And there are other things to consider when a mother expresses milk using a breast pump. What Affects How Much Milk Is Removed With A Breast Pump? There are many factors, other than the type of pump, which determine how well a mother can remove milk when using a breast pump. Temperature of the breast and breast flange). For some mothers, expressing comes easily. For others it can be like hitting their head against a brick wall – they seem to get nowhere with it. How Do Babies Remove Milk At The Breast? The way a baby removes milk from the breast is also an important factor to consider. When breastfeeding, babies remove milk by creating a vacuum with their tongue. The peak vacuum occurs when the baby’s tongue is at its lowest position. The manufacturers of the new pump claim the pump recreates the tongue motion, as well as the suction, of a real baby. However, videos of the new pump suggest it uses a peristaltic wave motion, instead of creating a vacuum, to remove milk from the mother’s breasts. When you hear manufacturers make claims as though they are indisputable facts, it’s best to be wary – especially when they don’t supply any scientific evidence to back up the claims. Until someone provides solid scientific evidence to support the claims about this new pump, my suggestion would be to save your money. 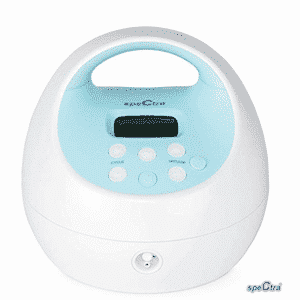 If you’re looking for a top breast pump, Spectra has become the popular choice for mothers all over the world. On the other hand, there is evidence to show babies remove between 63% and 72% of the available milk during a breastfeed. – See more at: https://www.bellybelly.com.au/breastfeeding/can-a-breast-pump-extract-all-the-milk-from-breast. Please note that you are misstating the outcome of the study, which essentially states that breastfeeding on demand is better than conforming to the averages. The approx. 62% of milk consumption is inconsequential measurement number which cannot be used to compare the effectiveness of babies vs. breast pumps for removing milk from breasts. For example if, during the study, mothers were told to increase the duration of the feed by 50%, it would largely result in more than 62% consumption of milk.